The latest census data confirms that divorce is going to happen to many married couples. As a result, single parent family units have emerged as the life style of the majority of Americans. Unfortunately, personal insurance policies have not kept pace with these changing life styles. This can be troublesome for married couples who are separated or who file for divorce. It is likely all personal insurance policies will need modification during the separation or divorce process. Every situation is different and multiple insurance policies are usually involved. Let’s take a look at just one, the homeowners policy. John and Martha are throwing in the towel. Living together is unbearable. So John moves out. He rents an apartment and now they have two separate households. He takes about $25,000 of his personal belongings and furniture with him to set up his apartment. Martha is agreeable to that. Where are the problems? Problem #1 – Who can make changes to the homeowner policy during separation? Can Martha delete John’s name from their policy? We recommend that all homeowners policies be written in the name of both spouses. This way, your agent can make changes to the policy on the orders of either spouse. However, once the couple is separated, we must have agreement from both spouses to make changes. Getting spouses to agree on a homeowner policy change can be an issue. That is why it is typical for a divorce judge to order that no changes be made to insurance policies once a divorce is filed. But during separation, the ground rules for behavior are not yet established. Separation is the “no man’s and no woman’s land” for divorcing couples. You might think that in order to avoid this problem that the policy should be written in the name of one spouse. Not a good idea. Let’s say for example, John is the only named insured. Beside the serious coverage issues for Martha, consider this, what if John had just left and could not be found? The policy was written in his name, so Martha is not a named insured. What if a loss occurred? Would she be covered? That can depend on the circumstances and the policy wording. This kind of uncertainty is an avoidable hassle. Always put the policy in both names if the real estate is owned jointly. 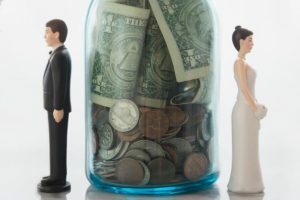 Some insurance companies will allow the remaining spouse to submit documentation confirming marriage, that the property is owned jointly and that the other spouse cannot be located. In these cases, the remaining spouse may be allowed to assume named insured status. Once again, who needs the hassle? Put your homeowners insurance policy in the name of both spouses. Problem #2 – Does John have coverage for the belongings and furniture he took to his new apartment under the homeowners policy which he and Martha own? Maybe. The homeowner policy does not provide for contents coverage at another household. To be adequately covered, John should buy a renters policy to cover his belongings in his apartment. However, some insurance companies are now taking a more liberal position. If both spouses are named as insureds on the homeowners policy, the spouse who sets up another household may be allowed to cover up to 10% of the Coverage C limit (contents) at another location. These companies say that they consider this a secondary residence, and limited coverage is extended. So there is no misunderstanding, the homeowners policy should be properly endorsed to reflect this change in residence location for a separated spouse. Warning! Check with your agent because policy terms and conditions vary. Problem #3 – Ok, the renters policy gives John insurance on his contents but what about his liability protection? John’s new renters policy will provide liability coverage. But his renters policy will not cover liability arising out of his joint ownership of the home where Martha is living. Protection for that exposure must come from the homeowners policy on that property. This is another reason to purchase a homeowner policy in the name of both spouses, if the property is jointly owned. This sounds simple, right? Well, it has been my observation that divorce is never simple. After all, separation and divorce occur because a couple cannot get along. So getting a consensus from both spouses can be trying. Even if the parties are amicable, the process is complicated and easily frustrating. If you throw in all the complications related to homeowners insurance, auto insurance, and personal umbrella insurance, real estate issues, mortgage issues, auto ownership issues and some emotional spice, the stew can become stressful and toxic. Call your insurance agent! You can take a giant step toward avoiding separation and divorce complications, such as an uncovered loss, by taking the time to have a frank discussion with your insurance agent. Then you should keep your agent informed because your insurance needs will change as you move through separation, the filing for divorce and the finalization of divorce. If you are separated or filing for divorce, please give us a call. We can help you with what you need to know to make sure your insurance protection is available when you need it. 4 Social Media Tips for 2017 Parents, Do You Know the Liability Risks of Your Kid’s Social Media Accounts?